This month on Literacy Toolbox, I shared resources to help parents explicitly teach their child comprehension strategies when reading. Good readers use these strategies without even thinking about it. It is our job as parents and educators to teach our children how to use these strategies so that they become second nature to them as they read independently. To help parents in that quest, I’ve compiled a list of several tools to aid in comprehension. These can be used at home when reading aloud. Most of the tools come from the company Really Good Stuff. They provide practical, hands-on, manipulatives and activities for classroom use. I figure if parents have access to the tools teachers use in the classroom, they can use them at home with their children, as enrichment (or to home school). The tools I’ve chosen are pretty self-explanatory and fairly inexpensive (under $12), and all pertain to helping children comprehend what they have read. Kids can roll these soft, foam dice to practice inferring, questioning, predicting, visualizing, determining what is important, make connections to their own experiences, and synthesizing information from their reading (several of the strategies I’ve discussed this month). Parents can read aloud and then have their child roll the die or have the child roll after they independently read. The set comes with two foam dice in two colors, 4” by 4” each and an activity guide. It is so important for children to be able to set a purpose for their reading and these cards can help. Select a mission card to place in the envelope you fold yourself, then reveal the task to your child before reading aloud (or before your child independently reads). The cards focus on the genre, characters and setting, vocabulary, making connections, author’s craft, and more. The set also comes with two write-on/wipe-off cards that allow you to create your own child-specific cards and an activity guide. Children will love drawing an egg from the velvet bag and cracking it open to reveal a comprehension question. The questions work for both fiction and nonfiction and include direct recall, making connections, making predictions, visualizing, inferring, questioning, summarizing and synthesizing. The set comes with 12 plastic eggs, 50 question cards, a velvet bag, and an activity guide. 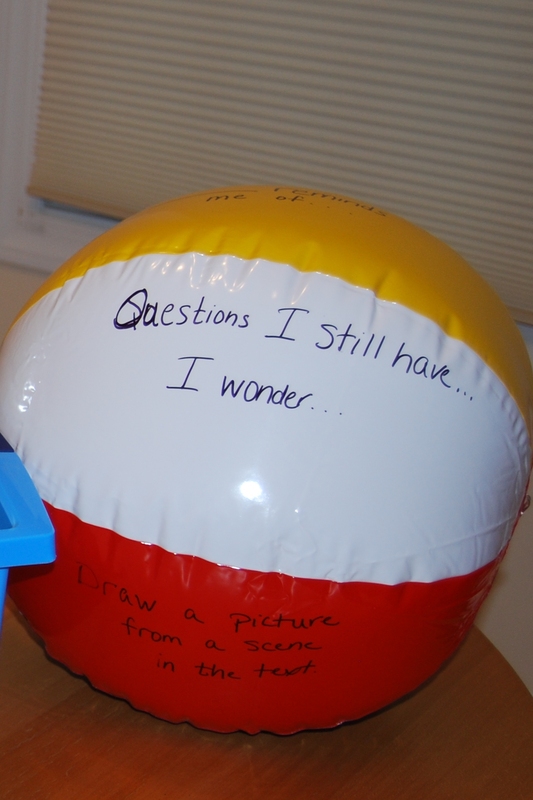 Inspired by commercial comprehension balls, I made my own comprehension ball using a plastic beach ball and a sharpie. Each section includes a comprehension strategy. After reading with my child, we toss the ball back and forth. We complete the strategy that our thumb is on when we catch it. Disclosure: While I love, love, love the company Really Good Stuff, I have not been compensated in any way for this post. Though, I would love, love, love if they would like to provide me with materials to review and giveaway to my readers!